Spectacular Lake Michigan views and sunsets, private beach and fireplace all within close proximity of the resort towns of Douglas and Saugatuck make this home the perfect vacation spot for a family vacationing with grandparents. Contact the owner directly to learn about reduced priced booking. Smoking, pets and guests of guests are not allowed. Linens and towels are provided. During summer and fall 2018, we have 5 bedrooms, 2.5 baths and can sleep 10. By spring 2019, we will have a total of 6 bedrooms and 3.5 baths, and can sleep 12 and with an additional full bath, bedroom, and sitting room with fireplace located in our lower level. There is central heat and air conditioning throughout the home. This ultra clean home completed in 2005 has a quiet private beach and a grand terrace overlooking Lake Michigan where you can enjoy outdoor dining with the large four burner gas grill, enjoy a Lake Michigan sunset or simply watch your family play a game of badminton on the lawn. First floor: The expanse of Lake Michigan is your backdrop as you first enter this home and take in the wall of windows that separate the outdoor terrace and views of Lake Michigan from the great room and adjoining kitchen. Hickory wood beams on the two storied cathedral ceiling adorn the great room which hosts a cozy wood burning stone fireplace, 42” plasma television, cable and on-demand video service, DVD player and an indoor/outdoor stereo system complete with multi-disk CD player. The fully equipped kitchen (dishwasher, gas stove and oven, microwave, garbage disposal, double door refrigerator/freezer, wine cooler) boasts a family-sized dining table in addition to kitchen-island seating with spectacular views all around. A full sized washer and dryer are located in the laundry room. There is a powder room and private office complete with laser printer. The first floor master bedroom suite has a king sized bed, indoor/outdoor stereo system, remote controlled ceiling fan & lights, and French doors leading out to the terrace. The adjoining private master bathroom includes a large shower, separate sinks and a whirlpool bathtub. Second floor: There are four bedrooms, a video gaming area and extra large bathroom with separate shower/toilet and double sink areas. Two bedrooms have phenomenal Lake Michigan views with glass/French doors leading to an outdoor shared balcony. These bedrooms are furnished with double and queen sized beds, respectively. The third very spacious bedroom is furnished with a king sized bed. The fourth bedroom is furnished with a trundle bed and can be outfitted with a toddler bed and/or crib for younger children. All upstairs bedrooms have remote control ceiling fans/lights and blackout shades. Beach: The 150 foot private beach is accessed by a staircase directly across Lakeshore Drive (a one lane road) in front of our home. Beach stairs zigzag down a bluff to the sand via four separate landings hosting viewpoint seating. Beach chairs, umbrellas, sand toys and beach towels are provided. There are two kayaks, two life vests and an assortment of inflatable rafts & boogie boards for use on the beach. There is an outdoor shower to rinse off beach sand located on the side of the house. Toys: There are two adult and two youth-sized bicycles, a portable outdoor fire pit, croquet, badminton, whiffle ball and other assorted toys for use. Fun within five miles: 1 mile to Downtown Douglas, 2 miles to Downtown Saugatuck, fine dining, art galleries, shopping, u-pick orchards and farms (blueberry, raspberry, peach, apple), dune buggy rides, wine tasting, golfing, sailing, boating, antiquing, live theater/music, film festival, hands-on art barn (mosaics, ceramics, fused glass jewelry making for all ages), state/local hiking trails/parks/beaches (Mt. Baldhead, Oval Beach, Douglas Beach, Saugatuck Dunes State Park), bowling, fishing and beautiful walks along the Lake Michigan beachfront or Lake Shore Drive. The home overlooks Lake Michigan and sits on a bluff with a private staircase leading to 150 feet of sandy beach directly in front of the home. 150 feet of beach located directly in front of our home accessable by private 99 step staircase. This house was perfect for our fall family weekend! Enough space, great location, and all the amenities! Kitchen was ideal for making meals at home; fireplace was a nice bonus for a cold rainy weekend. Owners were attentive, provided lots of information, followed up with us throughout the process and returned our security deposit right away. Highly recommend! Hope we can return soon! Beautiful home on Lake Michigan, private beach, gorgeous sunsets, easy access to downtown Saugatuck.... what more could you ask for! Tara did a great job of having the house in top order along with great advice for our stay. Our 4 boys are already asking when we can go back for another week. Perfect trip. House was extremely spacious and had everything we needed. Owners were responsive to any question before and after our stay. While we were at the house they had anticipated most needs (and most wants.) Lots of beach toys and even kayaks...which were great. We had a long list of things to do while there and we only did half of them because being at the house and beach were so great. Would recommend highly!! Our family was fortunate to stay once again in this amazing home on the shores of Lake Michigan near the adorable twin towns of Douglas and Saugatuck. This home is kept in immaculate condition with additions and improvements being made by the owners each year (this time we discovered a new granite counter top on the kitchen island and new mattresses on the beds). The home has a well-stocked kitchen, shelves full of books and games, a garage full of bikes, and plenty of indoor and outdoor toys for kids and adults alike. The owners take pride in their guests enjoying a comfortable and enjoyable vacation and provide an environment where many cherished family memories can be made. Our favorite family hangout spot is the large front terrace overlooking Lake Michigan. It’s the perfect place to start the day by enjoying the view over a peaceful morning coffee or end a relaxing day with a late afternoon cocktail. The splendor of a gorgeous Lake Michigan sunset can not be matched and falling asleep to the sound of waves crashing is pure bliss! Thank you Tara and Randy for another wonderful stay! We look forward to returning next year! This is our third year at this well kept and well stocked home on Lakeshore Drive. The view of Lake Michigan is spectacular and we love riding our bikes on Lakeshore Drive and into Douglas. The layout of the home is spacious and ideal for young children. The patio is great for outdoor dining. I can't say enough about this home and the location. The owners are great and attentive to any needs. we LOVE this home! 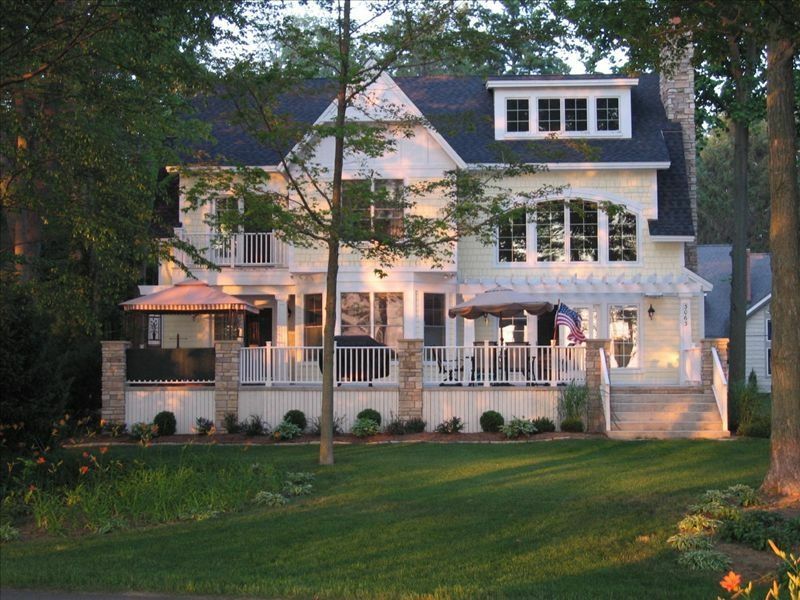 This magazine-worthy home was perfect for our week-long stay on Lake Michigan. Easily slept all 9 of us, had every amenity, including kayaks, you could imagine. Owners bent over backward to make sure our stay was a good one. Long trek to the beach, but you could enjoy it sitting on the front porch just perfectly. Hope to go back again someday!! Thanks. Tara and Randy!! Cancellation terms: $750 Refund of initial $1,000 security deposit and applicable VRBO fees if property is re -rented after cancellation. Full rental amount including taxes and cleaning fees (applicable to stays of less than 1 week) are not due until 90 days before stay. No refunds for cancellations within 90 days of stay unless property is re-rented after cancellation less a $250 charge. $200 addition charge if reservation is booked on line with a credit card, not for direct booking with owner. No fee for booking via echeck or a paper/mailed check. $250 cleaning fee for stays < 7 nights. No cleaning fee for stays of 7 nights or more. Michigan use tax is 6% on the rental amount. Property not available for weddings and parties. Must be 25 years or older to rent. Maximum occupancy 12. No smoking or pets. No guests of guests please.